Leon Mann, founder of the Black Collective of Media in Sport, has called on industry chiefs to introduce diversity in their panels or face a potential boycott – and thanked Raheem Sterling for putting racism in sports media top of the agenda. 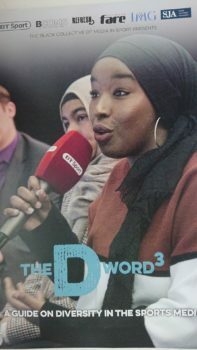 SJA committee member Mann was speaking at the launch of The Dword3, a guide on diversity in the sports media. He wants to see sports panels which are diverse and urges people who are invited to join them to check whether they are representative before they agree to participate – and refuse if not. Mann’s passionate plea resonated with a packed house at London’s Living Room, City Hall on Tuesday night in an event supported by the SJA. Speakers included the new lead executive of BBC Sport, Stephen Lyle, the head of women’s sports @givemesport, Benny Bonsu, and British sprinter Anyika Onoura. The message was clear. There has to be a visible change of culture, highlighted by England star Sterling’s comments in December which accused newspapers of fuelling racism. BCOMS has produced some facts and figures which make uncomfortable reading. There were 338 roles in broadcast and written media who covered the FIFA World Cup, winter Olympics and Paralympics, Wimbledon, Commonwealth Games and the inaugural European Championships. These numbers are based on eight major national newspaper titles and leading broadcast rights holders. Worrying statistics raised once again about the lack of diversity in sports media. As someone who has experienced it at all levels, I will continue to shout about the importance of diversity in EVERY newsroom. Well done @bcomstweet @Leon_Mann & team. Mann said: “Please don’t let this guide sit in a file you never open. Make it highly visible and use it as a reminder to everyone in your workplace that we have work to do.